You will log in with your email. 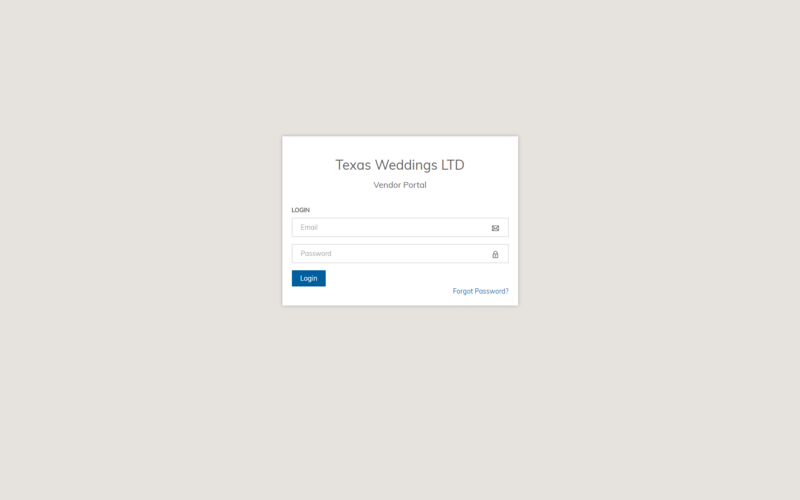 You should have received an email from NoReply@texasweddings.com instructing you to setup your account. If you did not get an email, you can click “Forgot Password” and enter your email. You will receive an email to reset your password. Once logged in, you will be taken to the vendor dashboard. 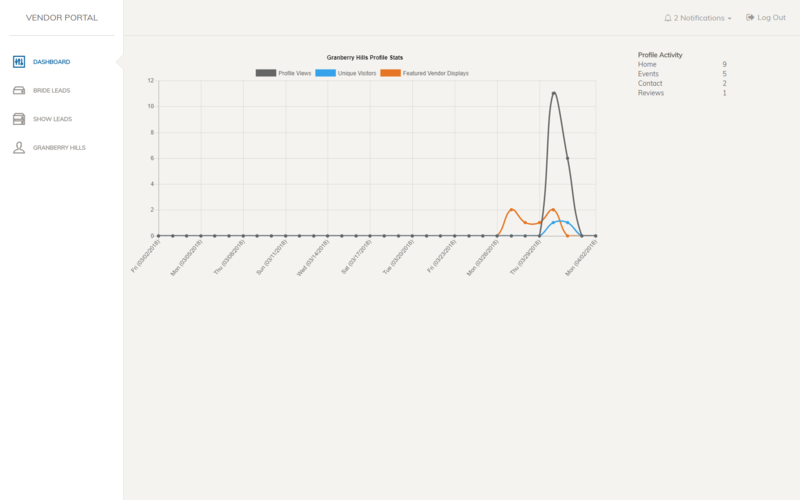 If you are a current advertiser, you will see live web stats for your web profile. This screen will display all of the leads available to you. 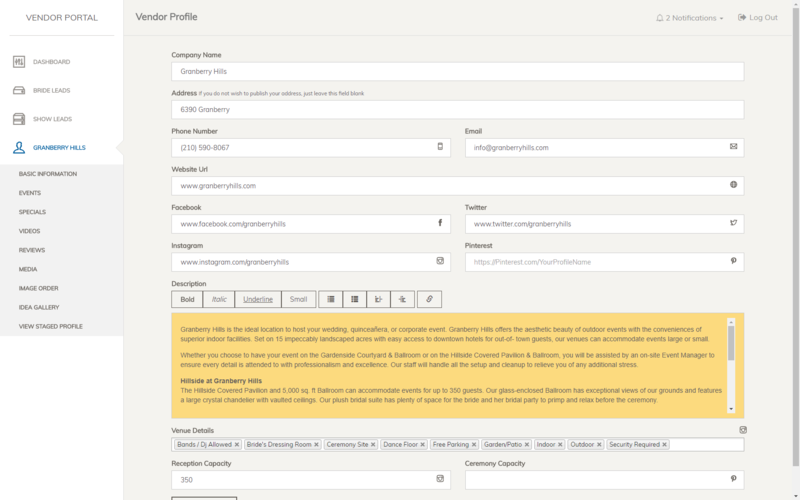 You have the option of filtering the leads by date added. To view more information on a specific lead, click “view info” on the right of the page. To download the leads you are viewing, click “Download to CSV”. The system will track when you last downloaded leads. 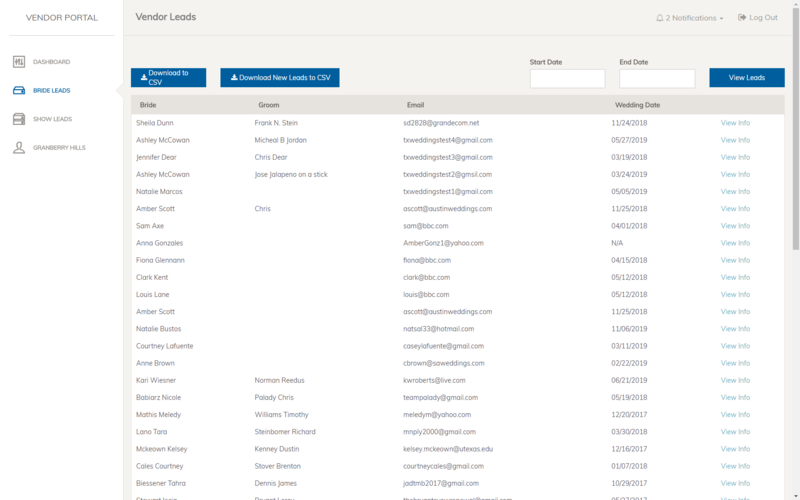 To download all of the new leads since the previous time you downloaded leads, click “Download New Leads to CSV”. The system will track when you last downloaded leads. All of the shows your company has participated in will appear. To view leads, click on the show title on the menu. All of the leads for that show will appear. 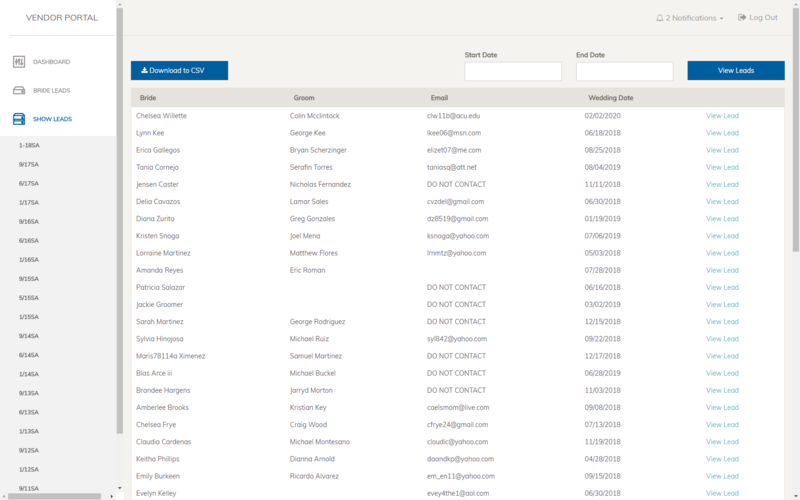 You have the option of viewing the lead information individually or downloading the entire list to a CSV file. 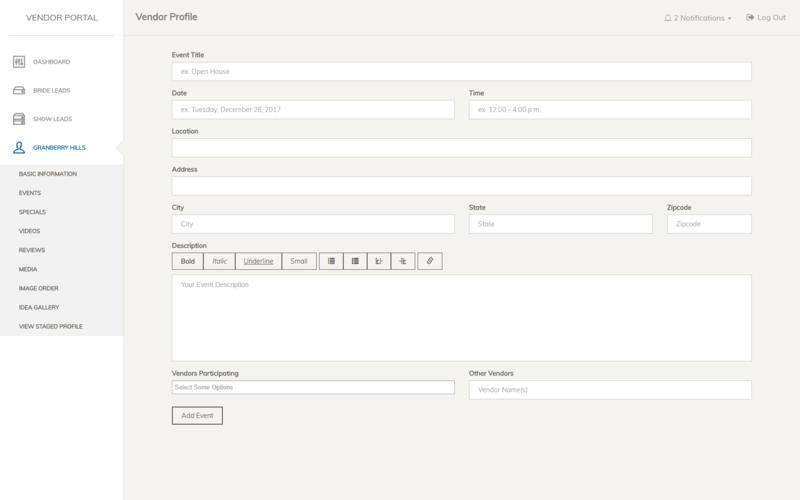 If you are a current advertising client, you will be able to manage your web profile through your vendor dashboard. Your profiles will appear on the left side menu. To manage, click your company name. 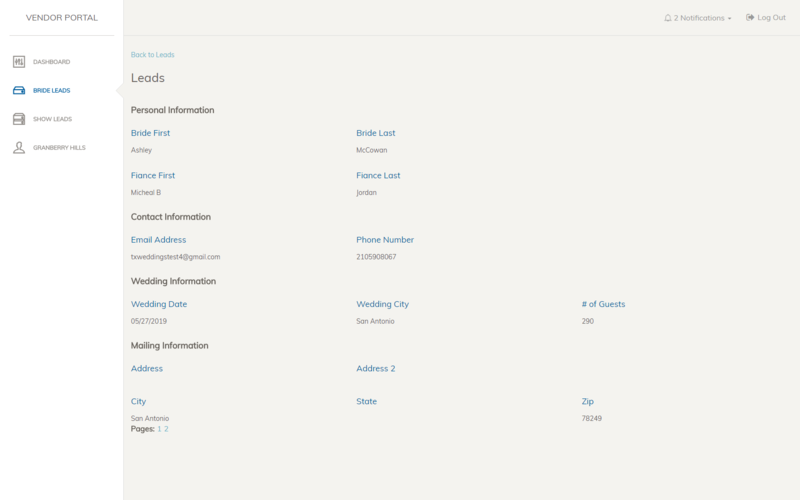 Click on “Basic Information” under your company name to view your current profile information. To edit any of the information, click in any of the text boxes and change the information. Once you have finished making updates, click “Submit Update” at the bottom of the page. You will see the pending fields in yellow. Any fields you modified will be sent to our web team for approval. If your changes remain “pending” for more than 2 business days, please contact our offices. 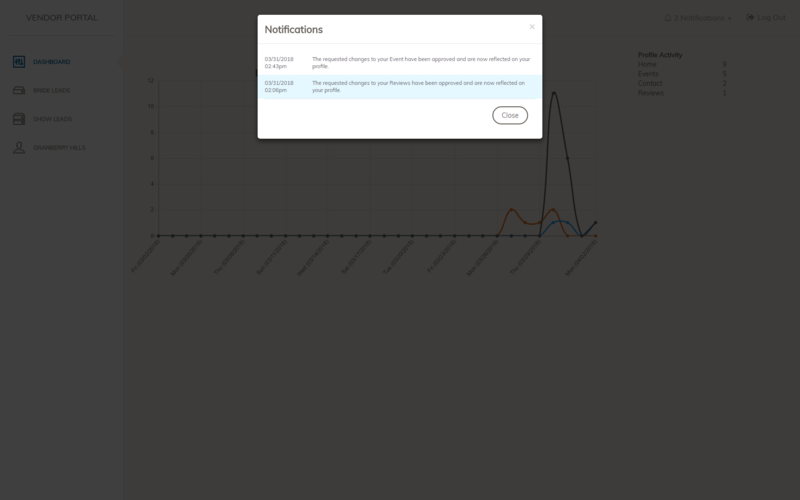 Once an update is either approved or denied you will receive an email and a notification in your vendor dashboard explaining the status of your update. We reserve the right to edit all submissions for accuracy, clarity, and correctness. 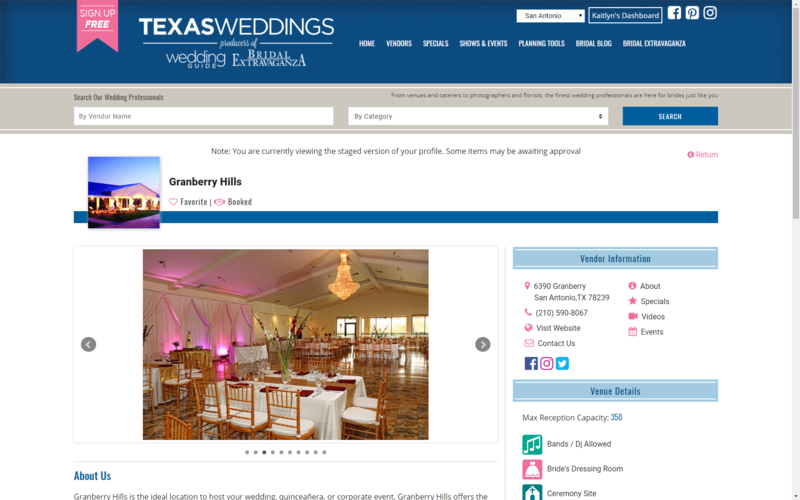 Updates may be denied due to vulgarity, hateful speech, unprofessionalism or any other verbiage that could harm the image of the Wedding Guide. To create a new event, click “Events” on the left side menu then click “Add New Event” at the top right of the page. To edit a current event, click “Edit” next to the event you want to edit. Make any changes to your event and click “Update Event” Your updates will be sent to our web team for approval. All fields must be completed in order for the event to be approved. To create a new special, click “Specials” on the left side menu then click “Add New Special” at the top right of the page. To edit a current special, click “Edit” next to the special you want to edit. Make any changes to your special and click “Update Special” Your updates will be sent to our web team for approval. All fields must be completed in order for the special to be approved. To add a new review, click “Reviews” on the left side menu then click “Add New Review” at the top right of the page. To edit a current review, click “Edit” next to the review you want to edit. Make any changes to your review and click “Update Review” Your updates will be sent to our web team for approval. To manage your videos, click on “Videos” on the left side menu. All of your current videos will be listed. Copy and paste the entire video link from either Youtube or Vimeo. Make sure your share permissions are set on the video to allow embedding. Add a video title and select the video type. Due to the method we use to embed the videos, you are unable to edit the video link once it has been added. If you wish to make changes to the video link, please delete the video and add it again with your changes. 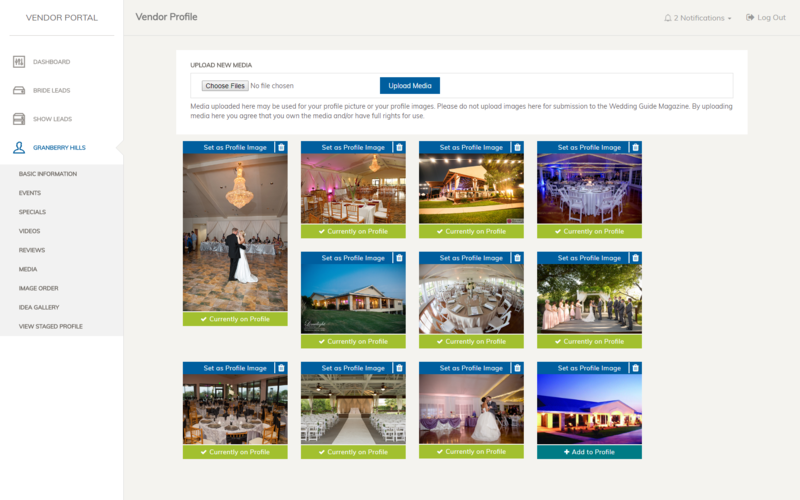 The vendor portal allows you to upload images that can be used for your profile photo or be added to your profile as a slideshow. Each image uploaded cannot be larger than 3MB and you are limited to 100MB total of all your images. By uploading any media to the portal, you certify that you own the media or that you have permission to use it publicly. To upload new images click on “Media” on the left side menu. Click on “Choose Files” at the top of the page. Select the images you want to upload then click “Upload Media”. The media will display as “Pending” until our web team has approved the media. To set an image as your profile photo, click “Set as Profile Image” on the image you want to set. A window will appear. Use the scale slider to zoom the image to fix within the box. Profile photos can only be set with approved media, although a new profile photo can be changed at any time without waiting for approval. To add photos to your profile slideshow, click “Add to Profile Slideshow” below the media item. 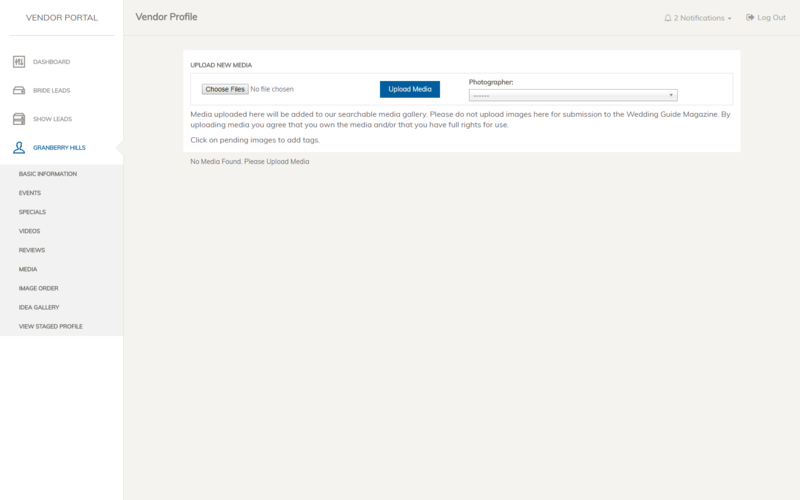 Media can be added to your profile slideshow while it is still pending approval. You can select the order of the images on your profile slideshow. To select the order, click “Image Order” on the left side menu. Click and drag the images to set them in the order you want. The order saves automatically and will respond on your profile immediately without needing approval. 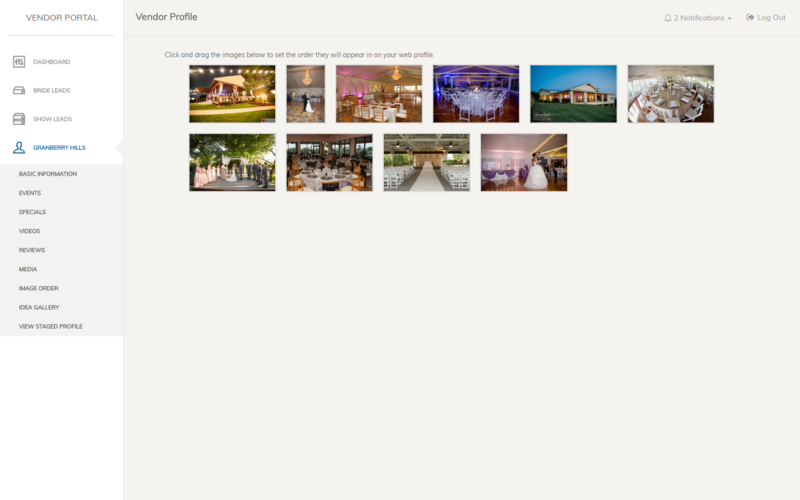 Our inspiration gallery allows brides to filter through hundreds of photos from our clients. By uploading media to our inspiration gallery, you certify that you own the media or that you have permission to use the media publicly. To submit photos to our inspiration gallery click on “Inspiration Gallery” on the left side menu. Click “Choose Files” at the top of the page. Select the photos you want to upload, then click “Upload Media”. Individual photos must be no larger than 3MB and no more than 5 photos should be uploaded at a time. Once an image is uploaded, click on the image to select the tags that relate to the image. All images uploaded will be approved by our web team before appearing on our inspiration gallery. We reserve the right to deny any images submitted for any reason. All the media you have uploaded to the inspiration gallery will appear on this page. Images submitted via the web or vendor portal WILL NOT BE considered for magazine publication. When making changes to your profile, sometimes you need to see how it looks on your profile. 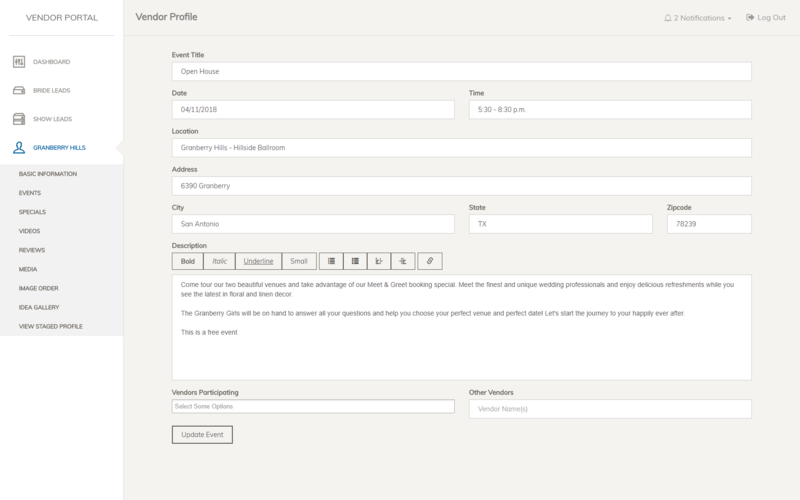 We have setup a “Staged” profile for you to view how your profile will look while items are pending approval. 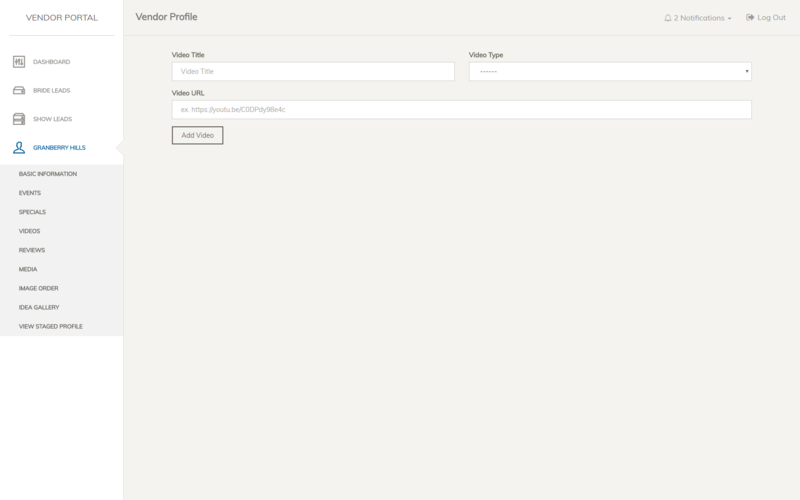 To view your staged profile, click “Staged Profile” from the left side menu. 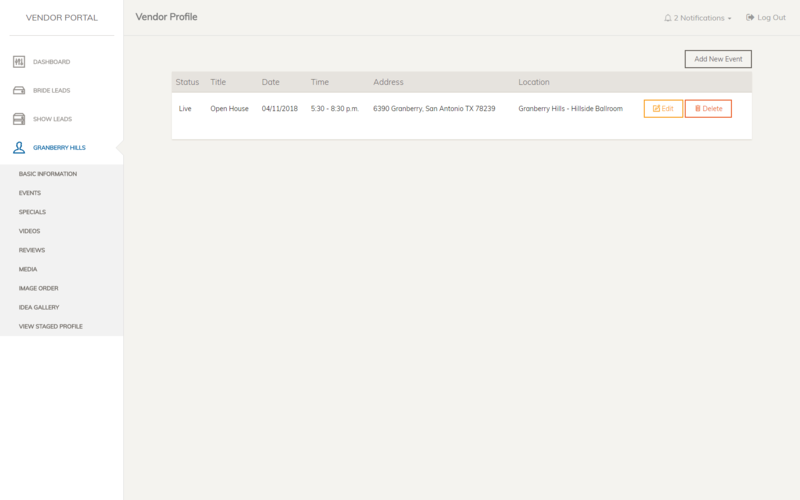 The profile will display a notice at the top notifying you that some items may still be pending. This profile acts exactly as your live profile will.